Football is a passion for most Peruvians, whether they reside on the high Andean plateau or in the Amazon jungle. They play it, root for their local teams and follow the national team. For those wishing to follow the Pervuvian national team, check out this ESPN SoccerNet page. The best sites, however, are either European or in Spanish. 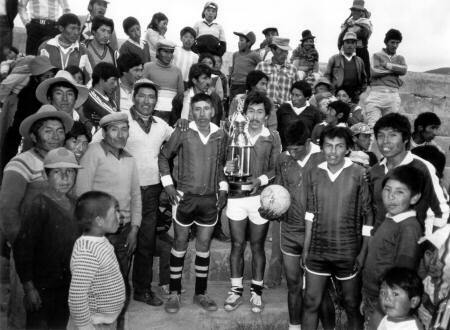 Although it's dangerous to engage in pop-psychology by trying to extrapolate from a single characteristic of a society, taking a closer look at soccer/futbol tells a lot about Peru. Peruvian sociologist Julio Cotler says that football played an instrumental role in forging a true national identity in the late 1960s and 1970s. The Peruvian national team surprised many by qualifying for the 1970 Mexico Cup by eliminating traditional power Argentina. The games were, for the first time, broadcast nationally. Cotler remembers seeing isolated Andean villagers march to nearby mountain plateaus so that they could get good reception on their battery- or generator-powered televisions. Those were the glory years for the national team, being led by Teofilo Cubillas, Hugo Sotil and others. Eight years later when Peru again qualified for the 1978 World Cup, this time in Argentina,	broadcasting companies sold rebroadcasting rights and microwave connections to remote cities and towns so that more Peruvians could hook right in to the national obsession and also be influenced by Mexican soap operas and US movies. It was an astute ploy to get provincial audiences to underwrite the expansion of TV broadcasting companies. The Peruvian team played poorly. Instead of a sport that was confined to Lima and the major cities, football became a national passion that brought together all factions, regions and races. Football has achieved sway in the country because of the bond between the support and the people. It is not a good business. There is little institutional support, with exception of a few pro teams. Even then, most installations and fields are grossly inadequate. Grass fields are a luxury. Selección Peruana - a fan's page about the national team. Peruvians are now playing in all the major football markets. Nortberto Solano plays for Newcastle United in England. Claudio Pizarro plays striker for FC Bayern Munich in Germany. There are several newspapers dedicated almost exclusively to Peruvian football/soccer, but the best is FutbolPeruano.com or Libero. You can also try InternetSoccer for a site in English.